As the year begins in the little red farmhouse, it’s always a reminder of things unfinished from 2017. Last year was a busy year for our family and my thoughts were consumed with decision making, planning, coordinating, and preparing every day life. Over the past few months I have felt the “winds of change” blowing. I have no idea what it means, how it’s going to happen, or when it will take place, but I feel it deep inside with an excitement of what 2018 is going to bring! In these past few months I have tried to find happy places to escape to. These woods are always my greatest escape. Since I was 6, I have walked in these woods. That’s 44 years (but who’s counting!!) There were no trails, less neighbors, and tons of wildlife. Over the years that has slowly changed, but luckily the “4 mile loop” we have created is land locked. If I am not walking I am 4 wheeling, horseback riding, or snowmobiling! I have shared these trails with many animals, most of them gone now, through the years. My first dog, Daisy. My first horse, Sugar. My next dogs through the years as a child, Princess, Sheba, Jeopardy, Ginger. Our second horse, Mandy. My parents liked to take us 4 kids on Sunday walks. My dad would always have a big walking stick and I remember being scared we would get lost and he would always say not to worry, the dogs know the way home. These past few months I have been finding myself wanting to escape this crazy world more and more and enjoy what we have without all of the negativity being thrown at us from every angle in the media, on the internet, in the magazines, etc. Even little Sissy has had enough and wants to join us on a walk!! Coming back up the trails after a nice long walk, the sun has set and the moon is beginning to peak out, I feel refreshed. The snow is glistening and the world is a perfect place again. One thing I have done since my children were born is compile a booklet of quotes that have touched me in my life. I hope when they are struggling in life or over joyed, they will find inspiration in one of the quotes I have chosen for them and know each one was carefully picked to give them a perspective from their mother to use throughout their lives. I keep this vintage milk bottle holder on our porch. It makes me happy to see it, even in the deep snow. There’s something about this that brings me back to a place in time that I wish to have been a part of. This was the sky tonight between our Island and Canada. It was a perfect “date” night to drift and reflect on our wonderful vacation rather than work on the yard!! Sometimes all you need is a bit of sunshine, warm ground, and a great place to rest your mind and body. 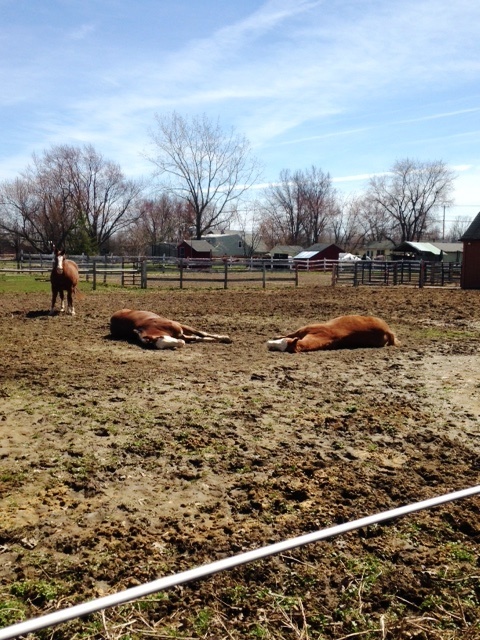 Coming back from a walk in our woods today the horses were enjoying the warm earth for the first time this season. I envied them being able to lay there in utter peace, no worries, no responsibilities, just to be. 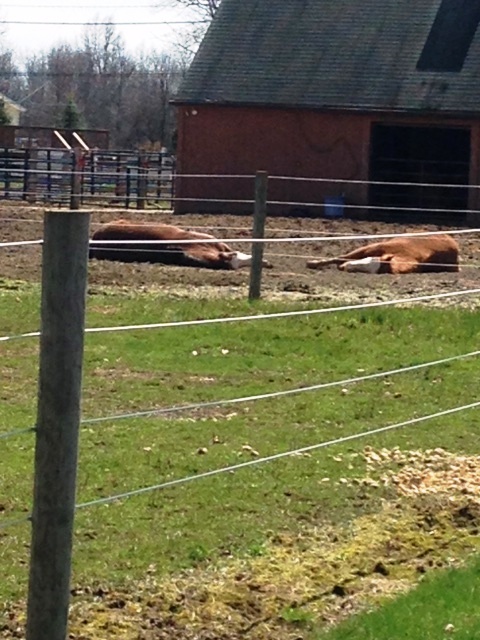 Interestingly enough the two relaxing are my geldings (male horses). They are both so different in personality. My oldest one turned 25 last week. This is a “senior” horse now. He’s always been a loving animal, so full of pride and so gentle. He has a very hard time trusting people and things and after 14 years, it still warms my heart to see him be able to relax like this. The other one is a 16 year old who has the personality of an eight year old boy. Full of mischief, inquisitive, loving and carefree. He trusts his older brother with his life. He does not like to be far from him and knows he can lay next to his brother and not have a care in the world. 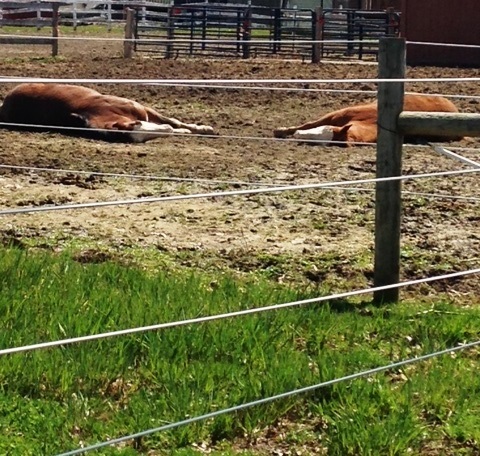 And yet while these two are having their moment of inner peace, there is my mare (female) horse standing to the side. She is an 18 year old gentle soul. She is brave and trusting and skimpy with showing her love for you. But it’s there and you can feel it even when she doesn’t show it. Stopping and looking at them after my relaxing walk, it came to my mind that she is like me. I want to relax, I want to lay on the warm ground and not have a care in the world. I envy people who are able to do that. 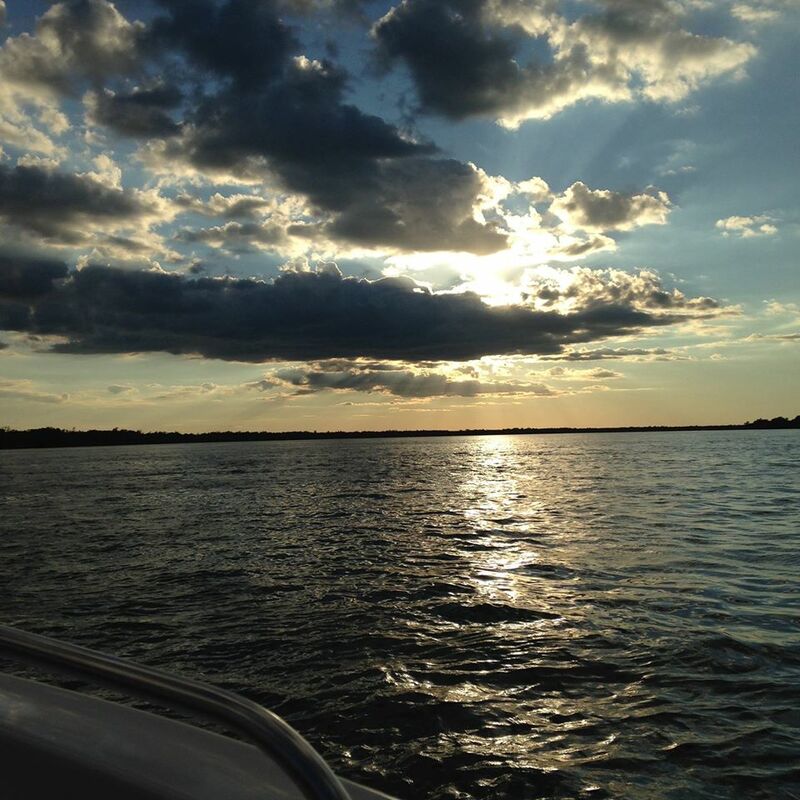 Shut off the world and just be. But that is not in my makeup. And so like my mare, I will be content with where I’m at and accept who I am knowing I may never be able to “just be” and that’s ok.
Having the right tools in the barn is just as important as having them in the kitchen!! 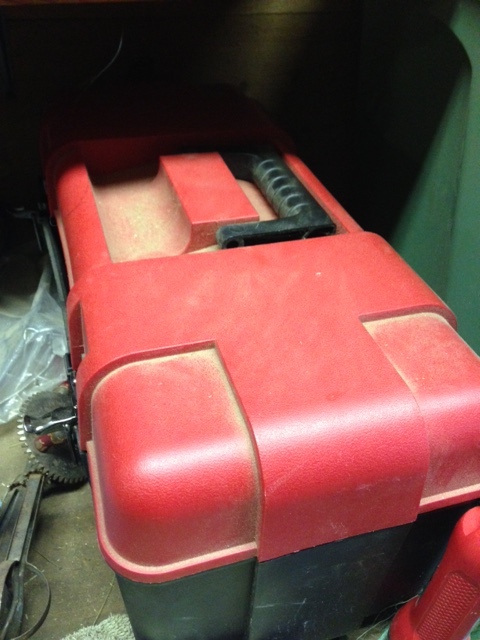 Here are some of my “must have” tools in my horse barn. 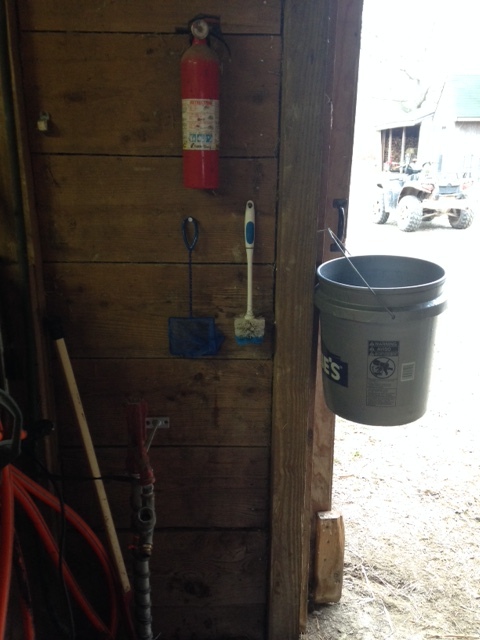 I keep a scrub brush and empty bucket for cleaning out the water buckets in the stalls. I scrub them and empty them to refill with fresh, clean water. I have an orange hose that is heated. I plug it in when I enter the barn and by the time I am done with stall cleaning and other chores in the chicken and goat houses the hose is ready to fill the water buckets. The blue fish net is an EVERYDAY item. 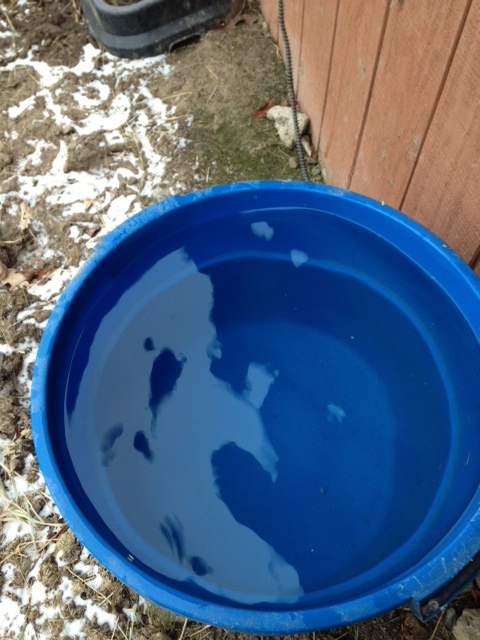 I use it to clean the water in the buckets on days that I am not emptying them and just refilling. 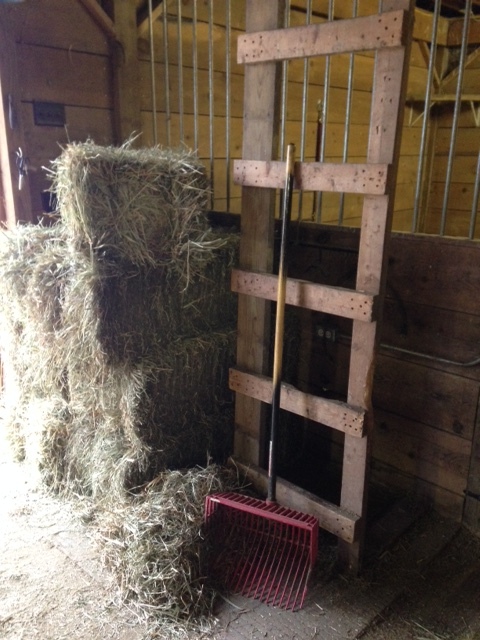 They catch all the little bits of hay or grain that may have fall in into the buckets. You just swirl the net around and the water is free of any debris and fresh. 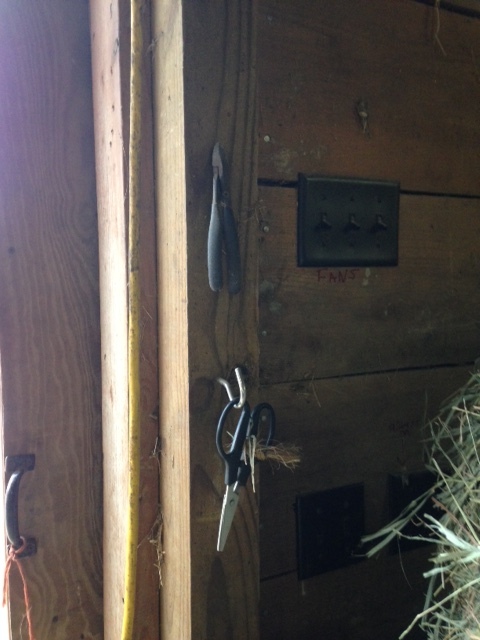 I have scissors and wire clippers hanging at the doorway to cut open hay twine or quickly nip/repair any part of the wire goat and chicken fencing. Having them at your finger tips when you need them is a great feeling. Last year I asked for a tool box for my barn. This is MINE only. It is off limits to the kids and the man of the house. 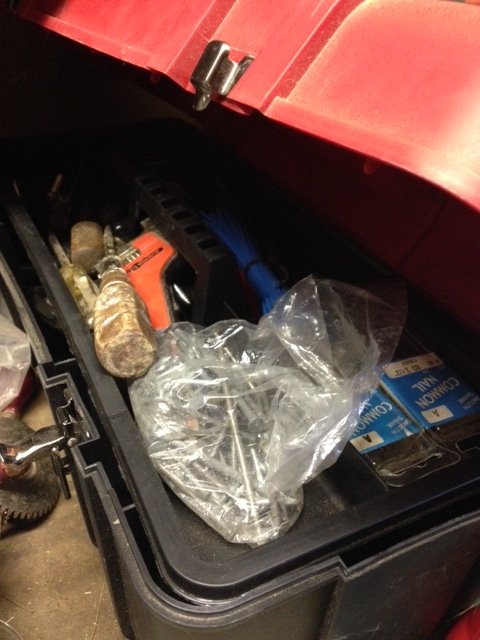 I keep a hammer, screw drivers, wrench, and all different size nails for any little projects I need to do in the barn. Those projects include hanging pictures and items that make me happy. 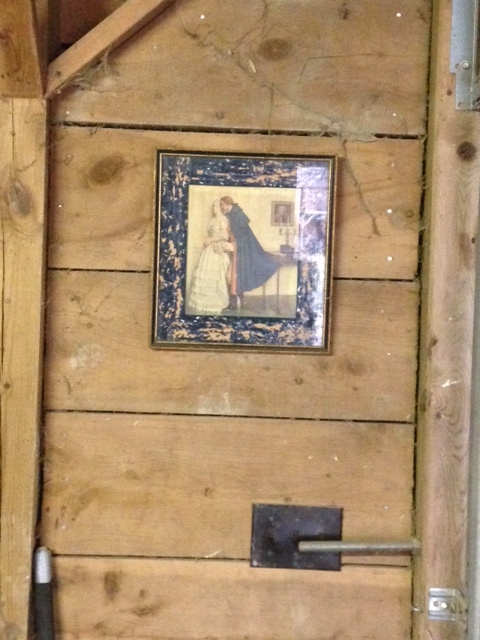 I love this oil barn painting that was found in a house after someone purchased it. It’s signed Adele 1956. 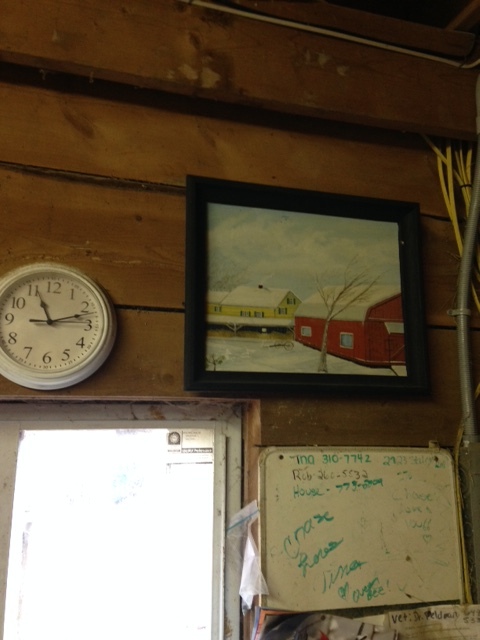 I painted the frame black and love seeing it every morning when I am in the barn. The blue framed picture is one I bought at an antique shop many years ago. I have no idea who it’s by but love the picture imagining it’s a soldier returning after a long time away and getting reacquainted with his woman. 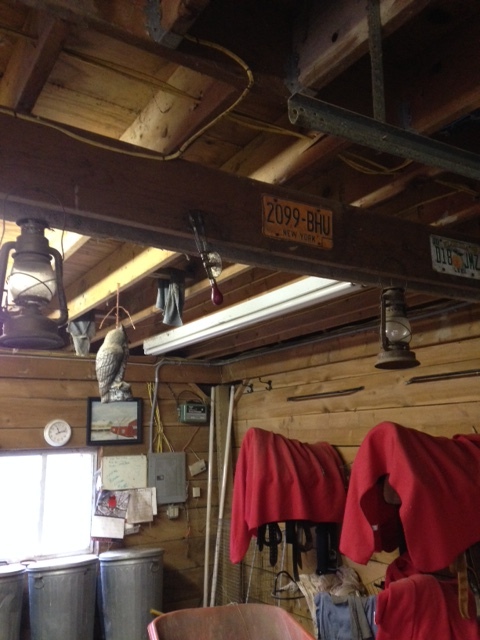 And last the old license plates from my parents, lanterns found in the woods and an old fashioned beater. I feel right at home in my barn. 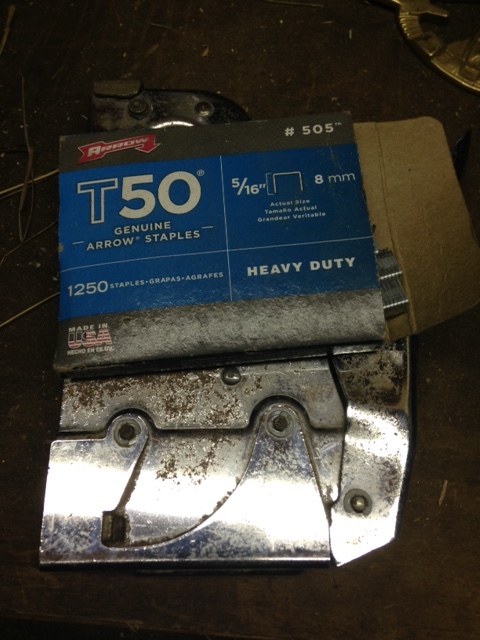 A staple gun is another handy tool for those days the wind is coming in the cracks of the doors. You can easily plastic them with a quick staple to the corner of a sheet of plastic. 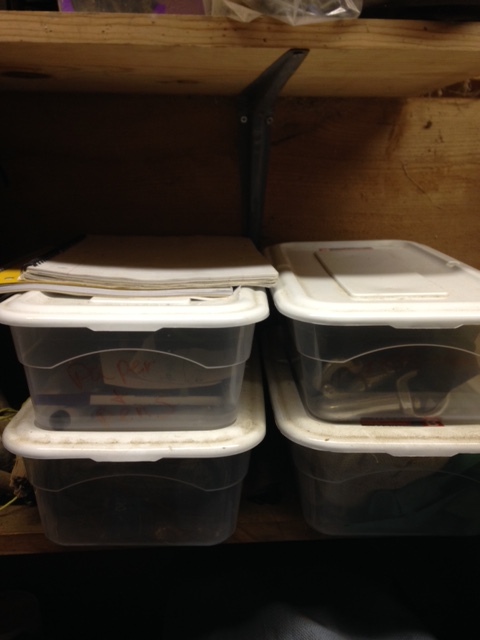 Plastic bins for important items such as paper, pens, leg wraps, injury wraps, etc. keep the items free from dust. 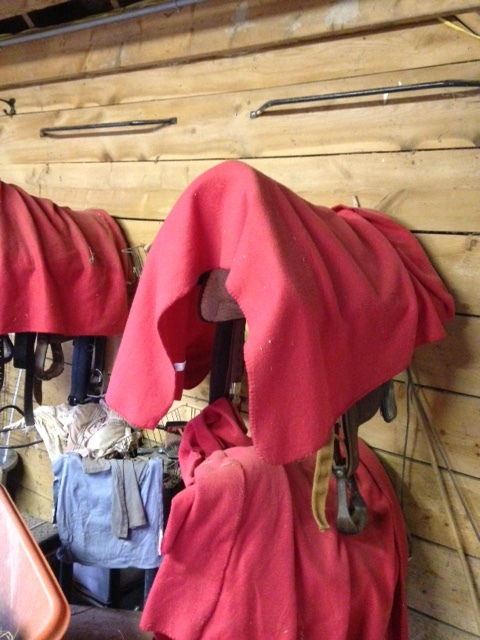 Felt blankets purchased at Walmart for $5.00 each work great at covering the saddles again keeping them free from dust and dirt and easily removed when getting ready to ride. 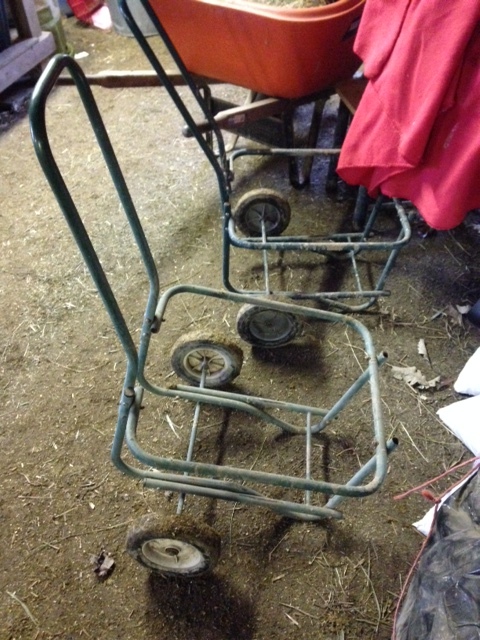 Bucket rakes and muck carts are another fabulous invention. They make picking stalls a breeze. I also keep a few around in case one breaks or for when someone else is helping (after you forced them) to clean stalls. 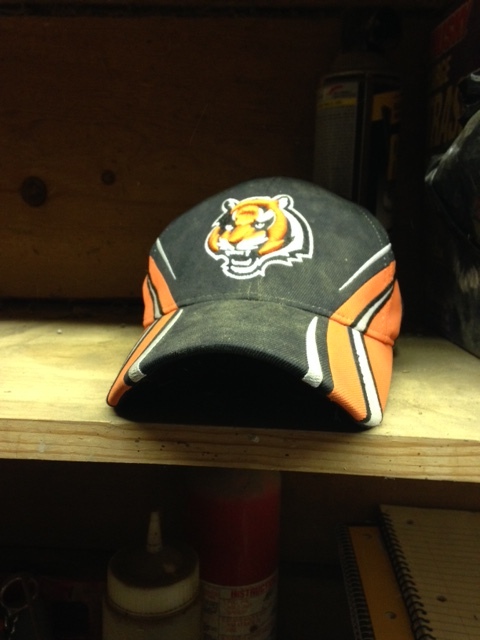 And last, but certainly no less important, is a baseball cap for those days you get stranded in the barn when it starts pouring! 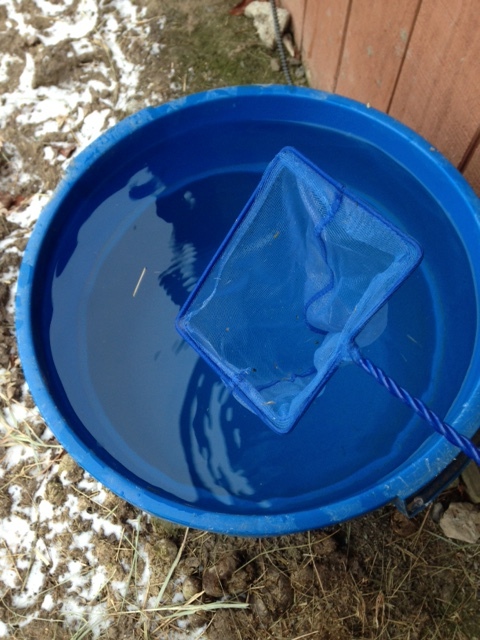 It helps keep the rain or snow out of your eyes when emptying buckets, bringing in all the animals or making a mad dash to the house.